Really? Time for our 40 Year Reunion? Already? Yep and we need help. There have been numerous inquires from alumni across the country as to when we are going to have our 40th Reunion this year. 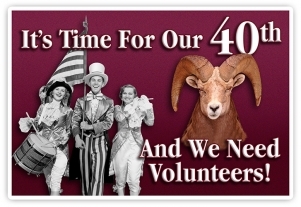 The good folks who have planned and handled the reunions in the past are not able to take that bull by the horns this time around and we need some volunteers who are local to the Sarasota area to donate some of their valuable time and stand up to the challange. Make Sure Your Info Is Up To Date In Our Classmates Section So We Can Be Sure To Get You Information On The Renuion!